Light + Love : How I Edit my Instagram Photos. A lot of people from my online community have been asking me how I edit the photos I post on Instagram. All the photos I post there are taken using an iPhone and Nikon 1, most of them are edited using apps. I usually edit my photos because I love my pictures bright and vivid. And if I ever want them muted, I just add pastel or vintage tones. The few times that I don't edit my photos are the moments when the lighting conditions are, well, perfect. This picture was taken at the beautiful Las Casas Filipinas de Acuzar using an iPhone 5S. The weather that day was wonderful. The sky was a lovely blue. Although this picture is okay, I chose to edit it because I prefer bright, colorful pictures. I use Snapseed to edit my pictures. 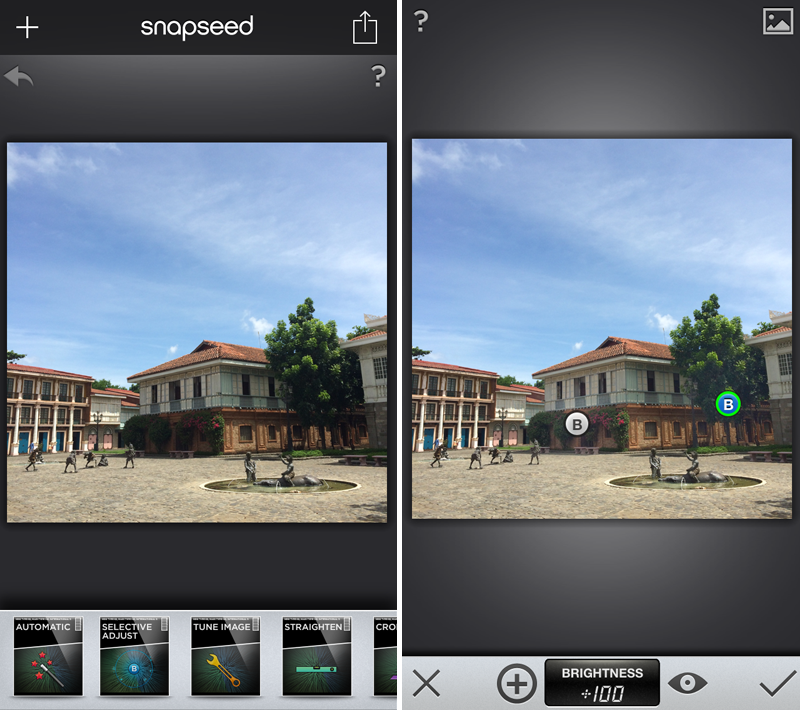 I think most people already have Snapseed, but if you don't have it yet, you can download it from the App store. First, I opened my picture in Snapseed. Since I think the brightness of the picture is okay, I decided to just brighten the dark areas where I want to see some details. So I used the Selective Adjust button and selected areas I want to brighten (see the B points on the 2nd photo). To do this, just click the plus sign (+) and then put it on the area you want to brighten. Also, I want to retain that really perfect blue sky. Then I clicked the check button on the lower right side corner when I finished. See the difference between this and the original picture? The dark areas are a little bit lighter now. After adjusting a picture's brightness, adjust contrast next. This is what I teach my students -- if you don't want or don't know how to edit pictures, just adjust the brightness and contrast of your pictures. It makes a lot of difference. 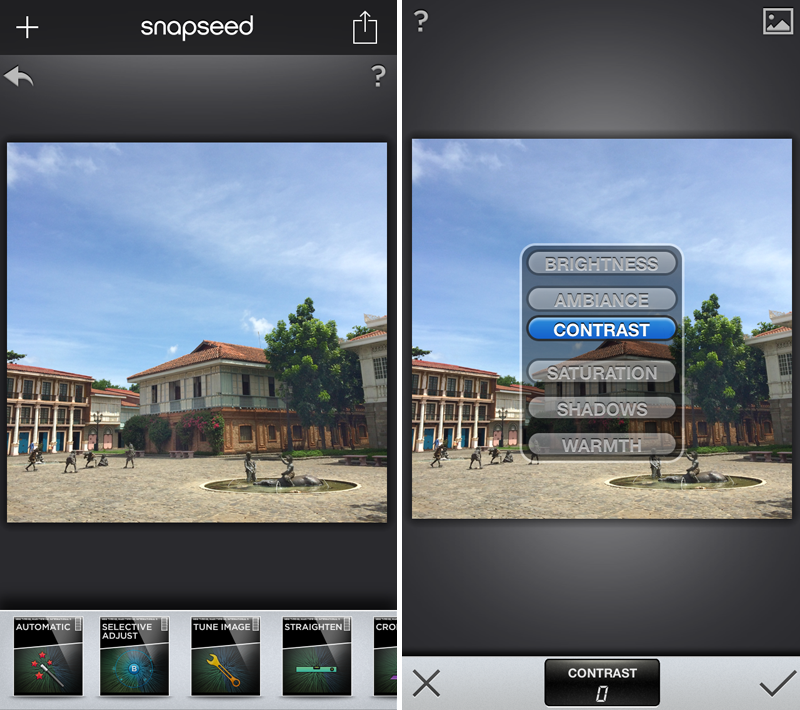 To adjust contrast, use the Tune Image button. 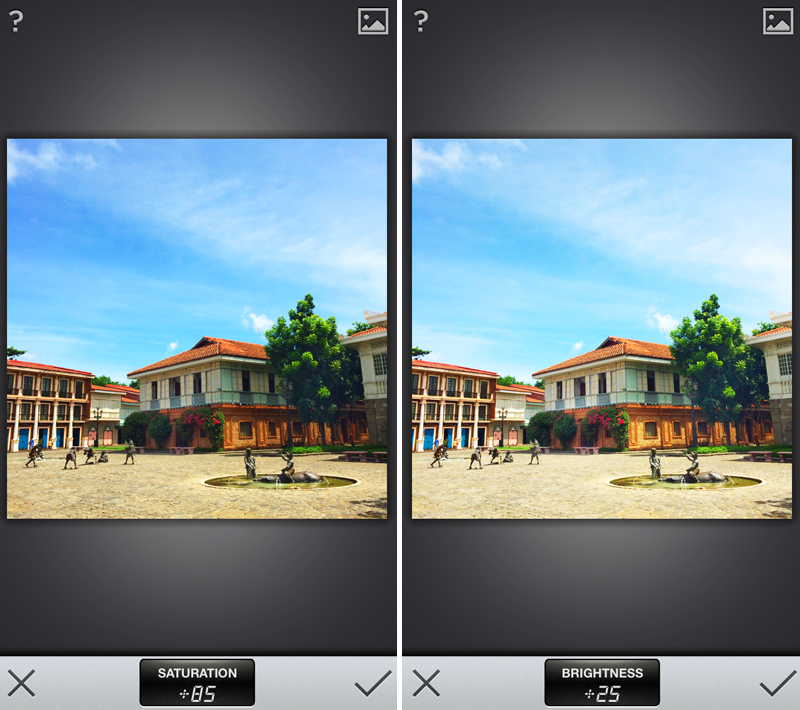 After opening the Tune Image button, put your fingers on the screen, in the middle of the picture, and a window will appear (see 2nd photo) and choose contrast. Adjust by sliding your finger left to right. Adjust contrast depending on your taste. Here, I placed it at 25% to get enough light and shadow. And then, open the window again (just put your finger on the screen, in the middle of the picture). Choose Saturation. 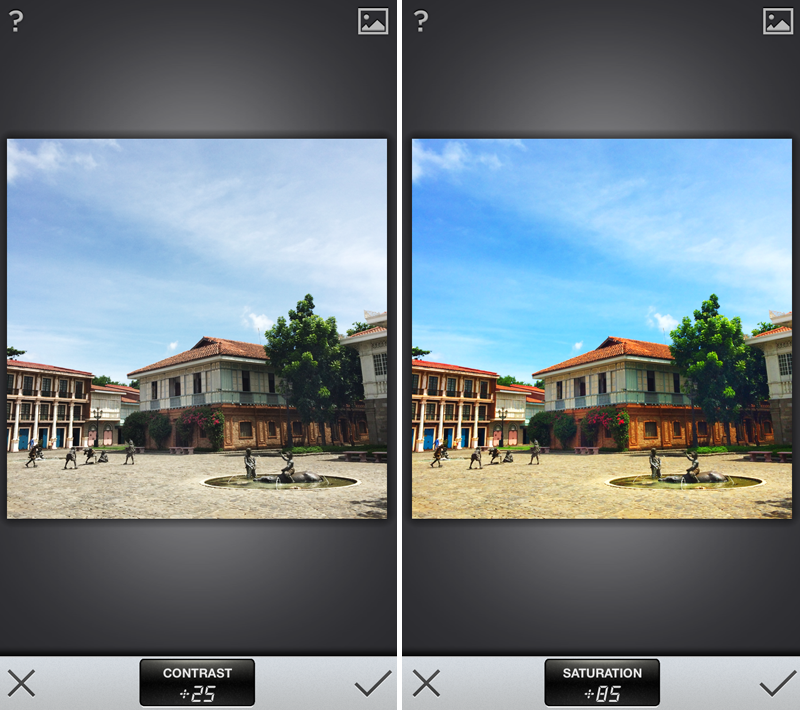 Adjust saturation to your liking by moving your finger left to right. I went all crazy and gave it 85%! The picture now looks pretty (and you can stop here if you want to), but I want my photo a little bit brighter. And if you are like me, then open the window again. This time, choose Brightness. Adjust to your liking. When you're done, click the check button on the lower right side corner. Do not forget to save your work. To save, click the arrow on the upper right corner and a window will appear. You can save your work to your Photo Library or post directly to Google+, Twitter, or Facebook. So here's our edited photo (on the left) and the original photo (on the right). It was worth all the trouble, right? Some days, I add light leaks or cool/warm tones to my photos. I'll share the apps I'm using in my next entry. Hey! Ill link his to my FB page, can I? 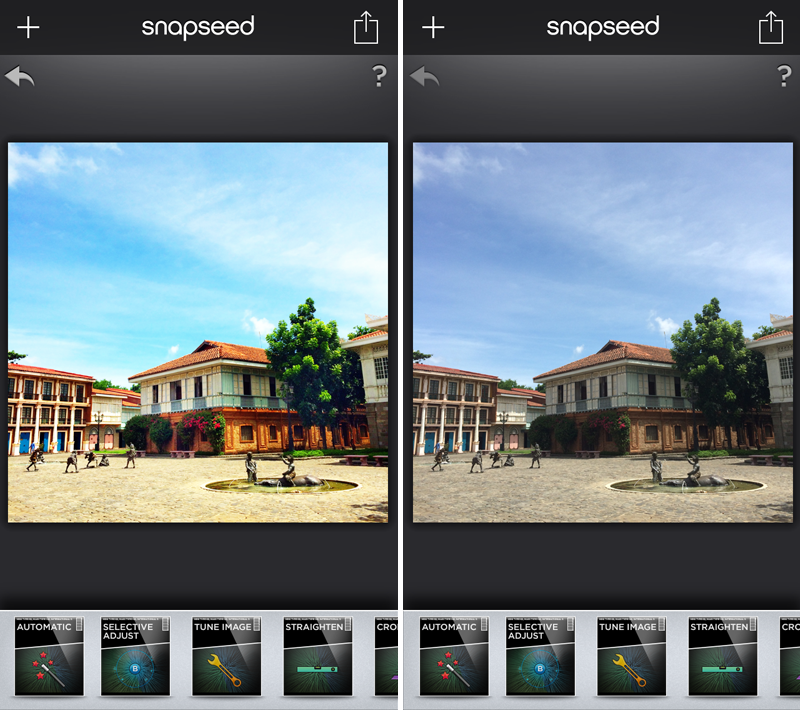 Some also ask me how to use snap seed and it's a perfect tutorial .... Thanks!